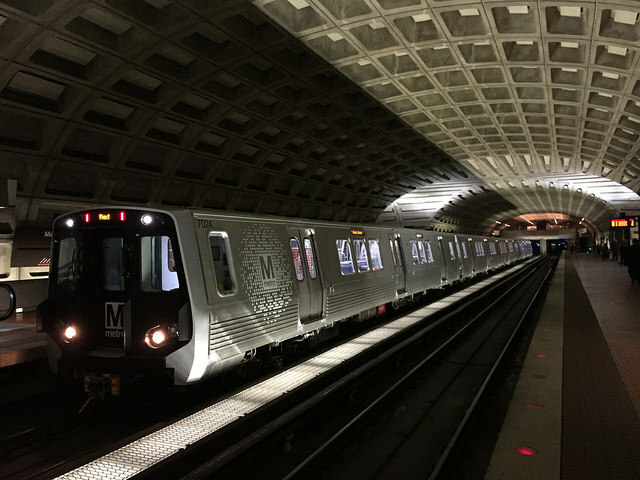 “Metro will provide frequent rail service during the afternoon and evening hours of Saturday, July 4, to accommodate those attending the fireworks display on the National Mall and the Foo Fighters concert at RFK Stadium. Several hundred thousand passengers are expected to take Metrorail on Independence Day, with crowds primarily traveling to and from the 9:10 p.m. fireworks display on the Mall, as well as other events around the region. Metrorail service will operate from 7 a.m. until 3 a.m., with near rush-hour service levels before and after the fireworks. Off-peak fares will be in effect until midnight. At 12:01 a.m. through closing on Sunday at 3 a.m., peak fares will be in effect in accordance with Metro’s standard fare policies. Metrorail: Open 7 a.m. until 3 a.m. Trains will run on a Saturday schedule. Parking: Free at all Metro-operated facilities. Fares: Off-Peak fares will be in effect all day. MetroAccess: Regular service hours. Subscription trips are cancelled. Please ensure all July 4 reservations are booked before 4:30 p.m. on July 3. Customer Service: Will be closed. Metrorail: Open 7 a.m. until 3 a.m. Trains will run on a Saturday schedule until about 2 p.m., and then gradually ramp up to near rush-hour service levels before and after the fireworks. Due to large crowds, bicycles and large coolers are not permitted. Silver Line trains will operate between Wiehle-Reston East and Stadium-Armory for the entire service day. Passengers traveling to/from stations east of Stadium-Armory will need to use a Blue Line train to complete their trip. Fares: Off-Peak fares will be in effect EXCEPT 12:01 a.m. through closing Sunday at 3 a.m. IMPORTANT NOTE FOR RIDERS TRAVELING TO FOO FIGHTERS CONCERT AT RFK STADIUM: This event is scheduled to end around midnight. At midnight, PEAK fares go into effect as scheduled (standard Metrorail fare policy). Please be sure you load enough value on your SmarTrip or farecard in advance to complete your entire trip. Expect long lines at fare machines at Stadium-Armory. Metrobus: Saturday schedule. Expect detours around the National Mall. Customer Service: Open 7 a.m. until 8:30 p.m. by calling 202 637-7000; Lost & Found will be closed. The closest station to the Mall is Smithsonian . However this is not your best choice. “Metro Transit Police today arrested a 14-year-old male District resident on charges stemming from six robberies along the Blue, Orange and Silver lines. The six robberies took place aboard trains and in stations between May 27 and June 15, and caused MTPD to issue a public alert to customers encouraging vigilance. All of the robberies involved iPhone 6 devices. MTPD detectives used video evidence to identify and charge the suspect.